*PLEASE WATCH OUR SHORT VIDEO IN OUR FAQ PAGE IF ORDERING ANY COLORS SHIRTS OTHER THAN WHITE* If you want to buy custom screen printed clothing and dye sublimation dri-fit shirts online, we make it quick and simple. 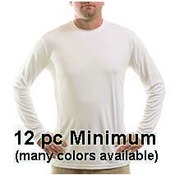 We offer screen printing services and dye sublimation printing on the highest quality SPF Dri-Fit Shirts. Our sun shirts offer up to UPF 50+ solar protection and are made of light weight, quick drying ring spun polyester. Our top quality UV Performance fabric fishing shirts will protect you from the sun's harmful rays as well as keeping you cool and dry. The fabric is powered by PURE-tech moisture wicking technology. It proves to be lightweight and comfortable and will hold a custom print that won't crack or peel. Our custom printed dri-fit sun shirts are 100% Microfiber w/ UPF Protection and can be custom screen printed or dye sublimated. 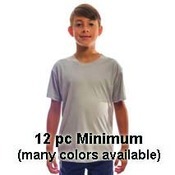 Choose from men's, women's, and youth and kid's sizes in various colors. Other customizable options include long sleeve , short sleeve, and dri fit performance hooded long sleeve shirts. Tees can be printed on the front, back, and sleeves in either a dye sublimation ink or a screen print process. In most cases we can mix and match colors and styles for your custom order. Use our Online Design Tool to create and buy online dri-fit apparel online. Customize a one of a kind loose fit rash guard for your next SUP race, beach vacation, or outside event. Upload your artwork or logo, use our provided free artwork, or our staff of graphic artists can assist you in creating your designs. We also offer custom screen printed apparel. 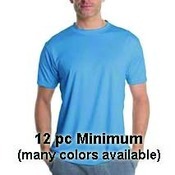 You can design all our cotton t-shirts and tanks available in men, ladies, and youth sizes. Custom printed with professional screen printed inks on top quality apparel. Shop our selection of customized screen printed apparel options. Buy your screen printed or sublimated clothing here online. 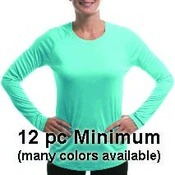 Choose from our catalog that offers long sleeve tees, tank tops, sun shirts, rash guards, and performance wear, and more. Our online store includes clothing available in 100% cotton, DryBlend moisture wicking polyester and cotton blend, or dri-fit performance gear. Create, Order, and Buy Online in 3 easy steps with our Online Design Lab. And right now, we are offering Free Shipping, including Alaska and Hawaii. We offer custom dri-fit printing services on the highest quality SPF Dri-Fit Shirts that offer up to UPF 50 solar protection ready to be custom printed . Our UV Performance fabric fishing shirts will protect you from the sun's harmful rays as well as keeping you cool and dry. The fabric is powered by PURE-tech moisture wicking technology. It proves to be lightweight and comfortable and hold a custom print that won't crack or peel. Our custom dri-fit sun shirts are 100% Microfiber w/ UPF Protection and can be custom screen printed or dye sublimated. 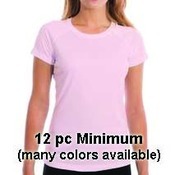 Choose from men's, women's, and youth and kid's sizes in various colors. Other customizable options include long sleeve , short sleeve, and dri fit performance hooded long sleeve shirts. Tees can be printed or on the front, back, and sleeves in either a dye sublimation ink or a screen print process. In most cases we can mix and match colors and styles for your custom order. Use our Online Design Tool to create and buy custom screen printed clothing or dye sub dri-fit apparel online. Customize a one of a kind loose fit rash guard for your next SUP race, beach vacation, or outside event. Upload your artwork or logo, use our provided free artwork, or our staff of graphic artists can assist you in creating your designs. We also offer custom screen printed apparel. You can design all our cotton t-shirts and tanks available in men, ladies, and youth sizes. Custom printed with professional screen printed inks on top quality apparel. Shop our selection of customized screen printed apparel options. Buy your screen printed long sleeve tees, tank tops, sun shirts, rash guards, and performance wear. Our online store includes clothing available in 100% cotton, DryBlend moisture wicking polyester and cotton blend, or dri-fit performance gear. Create, Order, and Buy Online in 3 easy steps with our Online Design Lab. And right now, we are offering Free Shipping, including Alaska and Hawaii.